a film by Cynthia Lukas and Kell Stearns, whose “Rumi Returning” drew a capacity crowd last year. 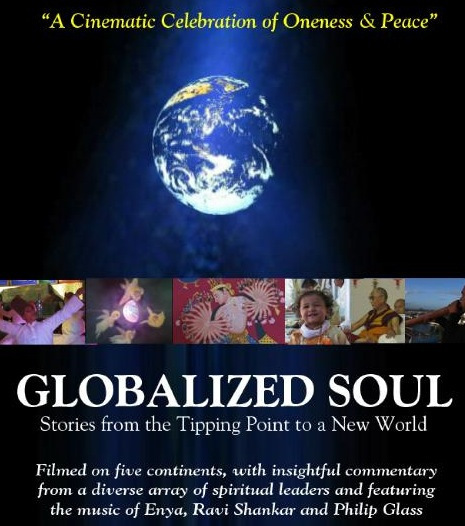 Following in the mystical tradition of “Rumi Returning,” “Globalized Soul: Stories from the Tipping Point to a New World” presents a mystic tour of humanity’s longing for love and peace. It features the spiritual wisdom of the Dalai Lama and sacred activists such as Sheikh Abdul Aziz Bukhari. A lavish visual odyssey, it was filmed in India, Turkey, Morocco, Israel, Mexico, the U.S. and the Parliament of the World’s Religions in Melbourne, Australia and set to the music of Philip Glass and Ravi Shankar. This entry was posted in Films and tagged Cynthia Lukas, Globalized Soul, Kell Stearns, Reel New Mexico, Rumi Returning, The Performance Space. Bookmark the permalink.